So, basically, for awhile now I've been experiencing various BSOD errors, to the point that i know them by heart. page_fault, kmode... all of them, and have been trying to battle it on and off with no special result. Even reinstalling my Windows a few months ago helped only for awhile, 2 weeks tops. 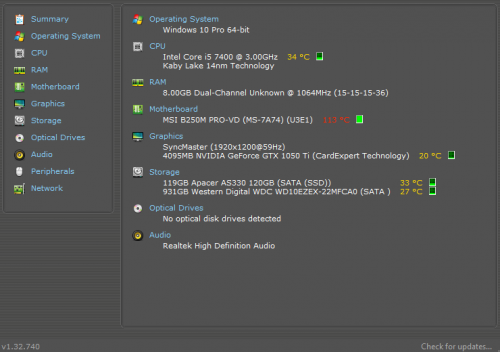 I use a fairly new desktop PC, one year old, and I'm pretty sure the issue is not hardware related. I've already done Memtest which showed no issues and I recall checking my hard disk in the past as well and I think there were no issues as well. It often happens when I play certain videogames (oddly enough, never when I play Blizzard games), but it sometimes also happens on startup, or when I use, say, Photoshop or watch a video via VLAN. I remember updating my NVIDIA Video Card driver and it didn't help. I always considered myself an intermediate computer user, but now I see that when it comes to troubleshooting real problems, I have no clue, so I would appreciate your help. What type of media did you use, full retail Windows DVD, downloaded ISO etc. Thank you for the fast answer, phillpower2! I used a bootable USB stick for my installation. For some reason, Speccy can't connect to the publishing website (googled the issue, suppossedly the servers are down sometimes?) so I saved a screenshot. I found 2 dump files, I think I must've deleted the others with CCleaner or some other software I used in the past few days. Hope it helps! 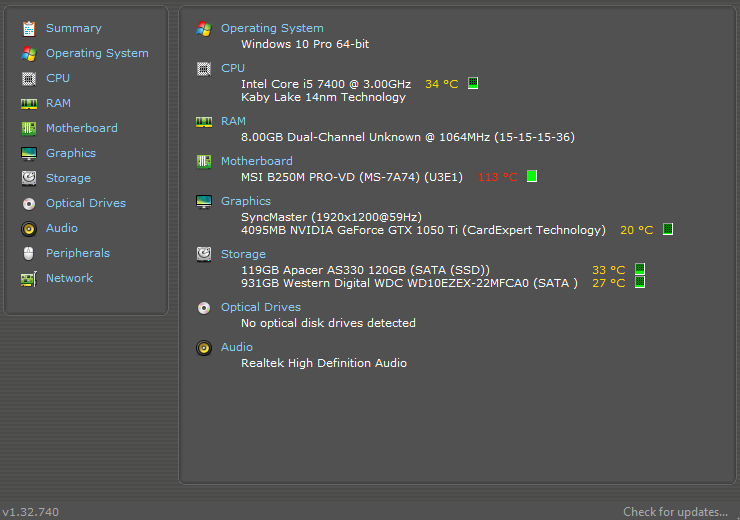 EDIT: I see my motherboard temp is way high? Is that an issue? Edited by krepandus, 18 November 2018 - 11:16 AM. The USB media that you used, was it downloaded from Microsoft and how long ago was it downloaded. rar are not used on the forunm, can you upload the dmp files using the method that I provided in my reply #2. Could have done with the Speccy url as it provides so much hardware and software info, will come back to it if we have to. The MB temp is off the scales and we do need to check it, sort the dmp files for us and while we look at them you can do some other tests for us. My apologies, I always see .rar and .zip as the same. There you go. To be frank, I'm not sure. I got it from my gf awhile ago and just always had it. Edit: Never had any issues on any pc before tho, nor were any activators included, so I don't think it's pirated or anything like that. Edited by krepandus, 19 November 2018 - 08:27 AM. To be frank, It's a pirated version of windows. One with which I hadn't have any issues on any computer I've installed it, only this one. Took a look at Speccy first and can see a couple of issues, any crash dmps may point to one or more of them as the possible cause, we will let you know once they have been checked. Unless on a metered internet connection Windows should be set to auto update, this keep Windows more secure from malware attack, it is also a good sign as to whether or not the OS is legit or not. Multiple AV programs are explained below but fwiw I personally would uninstall Avast and use MBAM/Windows Defender. Windows 8, 8.1 and 10 come with an improved Windows Defender, it offers the same real-time anti-virus/anti-malware protection as Microsoft Security Essentials. Windows Defender also shares the same malware signature definitions as Microsoft Security Essentials, and Forefront Endpoint Protection. Technically, Microsoft Security Essentials has not been renamed Windows Defender, or combined with it in Windows 8, 8.1 and 10. If you stick with only Windows Defender, once any other AV has been correctly uninstalled, check to see if Windows Defender has auto enabled and allow it to update and carry out a full scan of your computer. Active power scheme: High performance This setting is a form of overclocking that can cause overheating which in turn can lead to system instability, change the setting to Balanced in the Windows Power Plan. For Windows to be able to run efficiently and to be able to update you need to have between 20 and 25% of the partition or drive available as free storage space at all times, if you don`t you risk Windows becoming corrupt or not being able to update which puts you at risk of malware attack. Data only storage devices should not be allowed to get any lower than 10% of free storage space of the full capacity of the drive/partition on the drive. Uninstall as many unused programs, games, videos and music files as you can and get yourself another means of backing up to, post back when you have between 20 and 25% free storage on the C: drive/partition and we can go from there. Edit to add: DriverMax was implicated in one dmp, the other dmp nothing specific but the same Malwarebytes driver was shown to have failed to load in both dmps (mwac.sys) , Emisoft drivers also failed to load in the dmp that DriverMax was flagged up for. Sorry, I typed that in a hurry. As I said, I'm not really sure. I've never bought a Windows 10 copy, but have always used that one. I thought it's a pirated copy, but I asked my gf where she got it form, said the tech guys that built her PC made her the ISO on her USB, so there's that. I manually turned off auto update, cause some google searches in the past pointed out that Windows updates sometimes cause BSODs. I did manually update since then. I've turned it back on now. Understood. Now I remember seing some posts about avast causing BSODs because of, well... "something-something". I don't remember. Could it be because of the interference of the two AVs? In any case, I uninstalled Avast (by using CCleaner) and turned on Windows Defender again. Also, I'd like to say thanks for helping be. I know it's what you do, but still It means a lot. P.S. I've had 2 BSODs today, one while just being in Chrome on Youtube, and one just after, on startup. It is important that you only follow what is suggested by a person that is trying to help you with troubleshooting, the Avast clean removal tool when used correctly will remove all traces of Avast whereas using any other method can leave orphaned files behind that will not only cause conflicts with other AV software but also be hard to find and even more difficult to remove. Two BSOD but only the one dmp file. The info in the crash dmp suggests that the Windows registry is damaged, has someone used the CCleaner registry cleaner. My apologies. I did as you asked, all traces of avast have been removed now. Yeah, there was only one dump file in the Minidump folder for some reason, I found it peculiar as well. I also had a BSOD today, and no dump was created. They are enabled so I don't see why. I used CCleaner for registry scanning, yes, and have selected it to fix all issues. I do it everytime I do a cleaner scan. Thought it was... a good thing to do? I've figured the issue. Sometimes I get a BSOD but windows doesn't restart on it's own, so I need to hold down the power button and turn off the PC manually. I guess there's no dump created then. Here's one from today, when windows reseted on its own successfully. Arg4: ffffffffc000009a, usually the NT status code. Suggest that you try a refresh of Windows 10, see the Keep my files info at the tutorial here provided courtesy of Brink. So its my only option then? Reinstalling windows? A refresh is not a full reinstall of Windows, it is more like a first aid kit that Windows has built in that in some instances allows Windows to heal/repair itself, it depends on the damage that has been done. A refresh is both the best and the quickest option but you need to be aware that depending on how badly damaged the registry is the refresh option may not work which would mean that you would need to back up all of your data and then do a clean install of Windows. Understood. I dont have the windows copy with me atm so Im gonna do it in a few days and get back at you. Thank you. You do not need any Windows media for a Refresh as the setting is built into the present OS that is installed.